The self-congratulatory definition of a philanthropist was turned on its head by Robert Tressel in his book The Ragged Trousered Philanthropists.Tressel argued that the true philanthropist in a modern industrialised economy is not the wealthy benefactor handing out cash to charitable causes but the underpaid worker who gives of their labour and time to ensure the ruling classes are not put out of pocket through paying high wages. Written in 1910, the book has become a classic piece of socialist literature and was much thumbed by Robben Island political detainees. Ironically, Tressel nor his only daughter got any money from its publication, he having been buried in a pauper’s grave after succumbing to tuberculosis after numerous rejections from publishers. His daughter, apparently, only discovered it had later been published after accidentally seeing a dramatised version of it on television when she returned to the UK from Canada in her seventies. In a last attempt, she had handed it to a publisher before her departure across the Atlantic decades previously. There is thus a fascinating back story to Cape Town based theatre company Isango Portobello’s rich musical production based on Stephen Lowe’s adaptation for the theatre in the 1970s. It is the sort of musical production at which the company excels. Fortunately Isango Portobello has, thanks to their award-winning touring productions and founding producer Eric Abraham, deeper pockets that Tressel’s working class heroes. Which means we are treated to the rare spectacle of a home-grown production with of a cast of 29 performers, as many props as necessary, a lavish set, in-house lighting and a full set of bells and whistles. The play – to use a broad brush stroke – is about workers at a painting and decorating company who are exploited by the company owner and middle management, and how they come to mobilise themselves and fight for a living wage. Dramatising the birth of unionisation, under scored by the rousing a cappella protest songs adapted for this production, the play was a hit amongst the packed audience and many a fist was raised into the air during the rendition of The Red Flag and other protest songs. 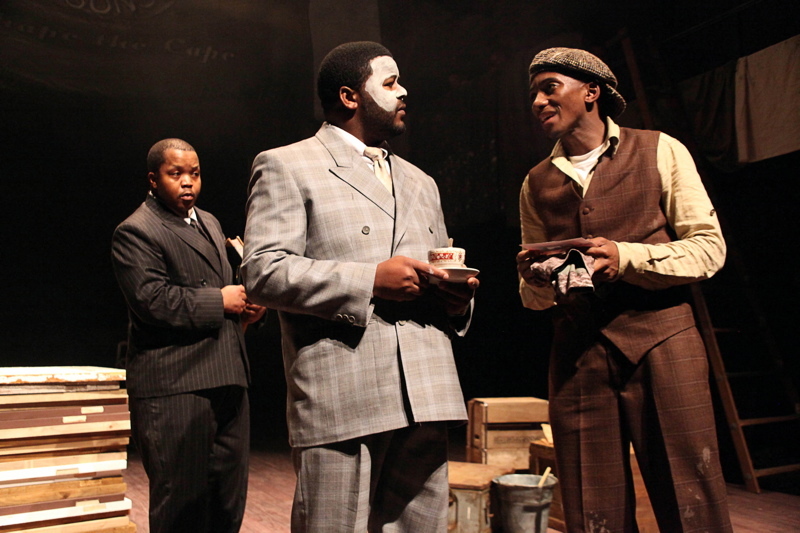 But it was rather a cop-out, I thought, to set the play in 1950s Cape Town rather than 2010 South Africa. The working class struggle remains pertinent and the play carries a strong social punch. But by setting it in a bygone era the contemporary message is dissipated in nostalgia, giving the BEE set who now have their hands on the till a free pass rather than delivering some home truths about the persistent barriers of class over race.